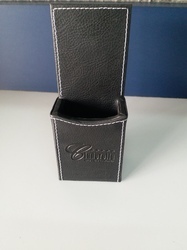 We are manufacturer and exporter of pu leather remote control stand Finely crafted from best grade pu-leather(Grains) with white seam at the edges. We are engaged in offering Remote Control Stand. We are a top notch supplier of Remote Control Stand. - Stuart Remote Holder from Bluewud has a Sleek design which takes up little space on the table. - It is made of glossy acrylic. It also has a foam base to prevent noise while keeping remotes. - Polyurethane base pads underneath make sure that the holder doesn't slip while using. With the aid of in-depth knowledge of this domain, we render the handpicked quality of Remote Stand. Their rugged construction and elegant design, makes these products highly demanded. Our company is among the renowned names in the industry for offering an extensive range ofRemote Control Organizer. Experts develop this product by following worldwide industry standards. We manufacture, supply, trade and export a wide variety of Wooden Remote Stand. This stand serves dual purpose and can also be used as mobile stand. Made of high quality wood, Wooden Remote Stand is light and portable. We are involved in offering high-quality Wooden Remote Control Stand. Additionally, we offer these holders at rock bottom prices. 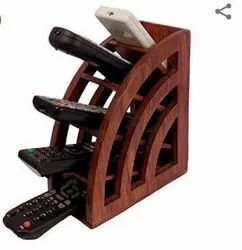 We are ranked on top by offering the best quality of Wooden Remote Holder, which is known for its remarkable finish and quality.